I’m enjoying my Metal/Jewelry III class quite a bit and improving my skills at sawing, shaping and soldering. Slowly I get more practice and improve. 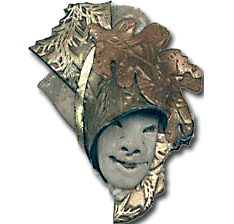 Each piece I do involves learning new skills and developing my ability, and that means learning from my mistakes and my successes both. This project involved stone cutting as well, and let me tell you –petrified wood is HARD and tough to drill! 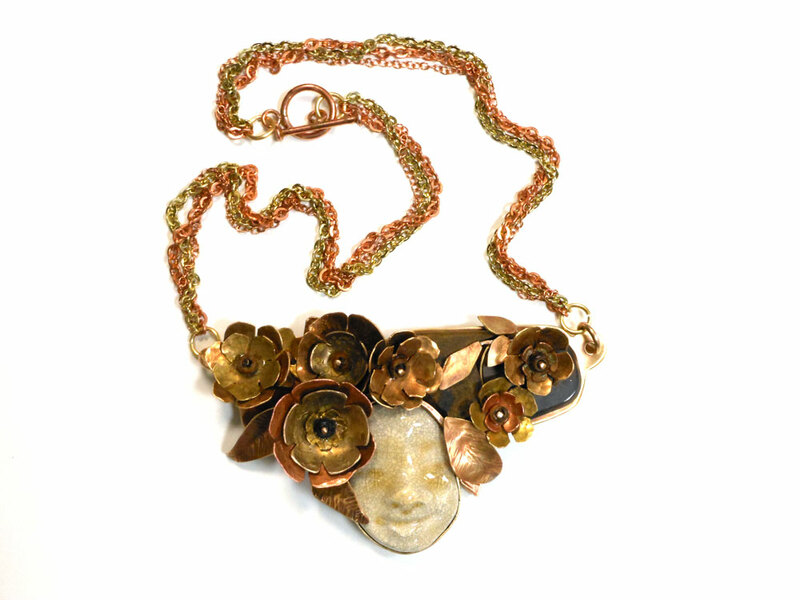 I used bronze and copper to shape flowers, leaves, and a back with a bezel to hold a ceramic face that I made this summer. I made it using a silicon mold I formed from a polymer clay original. The petrified wood cracked when I was drilling the third hole, but I covered it up with some of the flowers. I’m very pleased with the way it all turned out!